Yesterday, the first lengthy stop of a full day outing was at Cerro Burro. 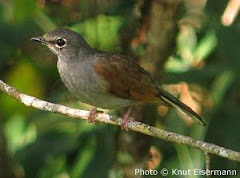 The best two birds for me were the Red Warbler and the Cinnamon-bellied Flowerpiercer. The white spot on the Red Warbler was very visible. I got a good, close look at this bird at an altitude of 10,726 feet. We were also treated to this Tree Frog. Georgia of http://patzcuarobirder.blogspot.com/, Mike "the Herp Guy", Ed and Dottie of Marble Falls TX, and Glen and Tracy made a good day of it. We finished up at Arroyo Frio, south of Tacámbaro, where the Russet-crowned Motmot did not disappoint us.